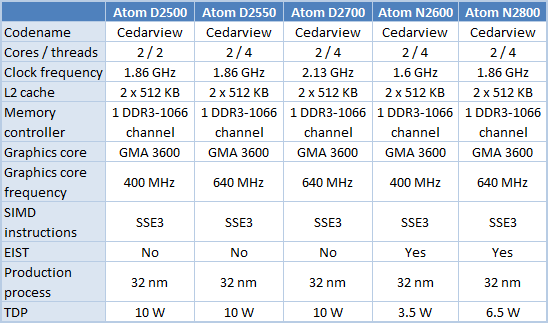 The heart of the Intel Desktop Board D2500HN is an Atom D2500, the junior model of the Cedarview series. This main board is quite a typical implementation of the Atom concept. 1.86 GHz dual core Intel Atom D2500 (Cedar View) fanless processor. 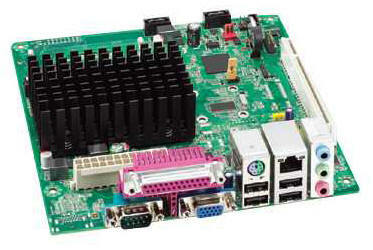 Low-power Mini-ITX mainboard featuring legacy I/O. Ideal for nettop, point-of-service, and digital signage applications. .The D2500HN "Houlton" Mini-ITX mainboard features Intel's dual-core D2500 Cedar View processor with integrated GMA 3600 graphics built directly into the CPU, improving performance and energy-efficiency over the previous generation of Intel Atom processors. Designed to bridge the gap for applications using dedicated peripherals that nonetheless require HD media playback capability, the D2500HN combines a more powerful processor with legacy I/O including a Parallell port, VGA, and a PS2 keyboard/mouse port, in addition to RS-232 COM, 4 USB 2.0, and Gb LAN. Fanless and efficient, the D2500HN is an excellent, low-cost solution for use in a wide range of Internet-centric applications. Please Note: Due to graphics driver limitations, Intel’s Cedarview-based mainboards are only fully supported in Windows 7 and Windows 8 32-bit operating systems.